Student speaker and distinguished scholar Paul Seltzer gave a speech about how his liberal arts education taught him to question decisions, like when longtime J Street employee Rochelle Kelly was fired. The student speaker at the Columbian College of Arts and Sciences’s second graduation ceremony Saturday spent his few minutes at the podium decrying campus dining administrators for their allegedly illegal firing of a 25-year employee. Distinguished scholar Paul Seltzer told his peers and their families the story of how his liberal arts education prompted him to lobby the University to rehire Rochelle Kelly, a 51-year-old J Street employee who was fired for taking too much time off after her heart attack and her husband’s stroke, advocates say. “It’s important to remember we’re only just beginning the role of world-changing that the liberal arts have taught us to pursue,” Seltzer said. He also said he learned that collective action is the key to power, speaking about how his student organization, the Progressive Student Union, launched a campaign that collected more than 400 letters from students, faculty, alumni and parents asking J Street’s General Manager Bernadette Thomas to rehire Kelly — all within 48 hours of Kelly’s firing. Seltzer solicited the audience members to take up the fight with him, reciting the email addresses of Thomas and Director of Campus Support Services Nancy Haaga, who oversees campus dining. Seltzer received loud cheers from the audience. “The fact that we do that work together means that we have immense power,” Seltzer said. In March, several workers denounced GW for firing Kelly, calling the termination of her contract uncalled for and noting that it violated their worker agreement. The University declined to provide the Hatchet with a copy of the labor contract. Thomas declined to comment on the decision to fire Kelly, citing privacy concerns. 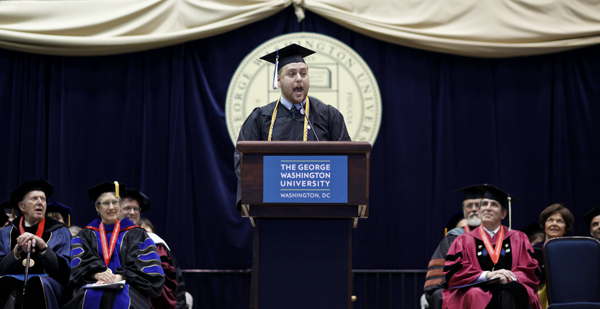 “Sodexo respects GWU students’ right to share their opinions. We also understand that there are assumptions being made regarding this matter without the facts. This is a personnel matter and we will not comment,” Thomas said in an email two months ago. Elizabeth Simonofsky, who graduated with an art history degree in December but walked with her class Saturday, said she thought Seltzer’s speech was a welcome departure from traditional graduation speeches. She added she wasn’t aware of the campaign before, but said she would email the administrators after hearing it.